Before heading to Itaewon, we decided to stop by Mr. Pizza, one of the Korean pizza franchises that sells your not so typical pizzas. By far, this is the strangest pizza menu I've seen that really makes me treasure and miss the classic New York slice. 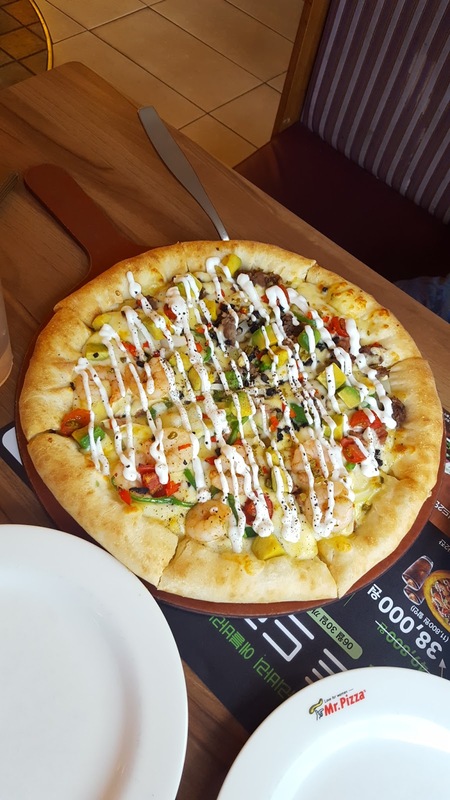 The pizzas come in different sizes, usually 8" or 10" and have toppings such as beef, shrimp, potato, corn, etc. I mean really, why settle for something that looks like your typical pizza when you can have the Korean slice? 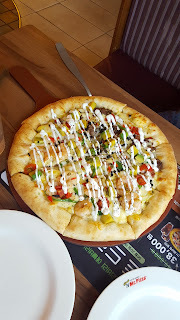 We took up this challenge and ordered this pie with avocado, shrimp, peppers, raw onions (yes, i meant raw onions, not just onions), olives, and then the other side was the same except there was bulgogi instead of shrimp. Imagine going up to a Domino's in the States and ordering that. What a mouthful. You thought the list of toppings was already too many choices? We haven't even started on the crusts. Oh boy. Korean pizzas sure love their sweetened variety. There's the original crust of course, and more--they have a cheese cap crust (stuffed with cheese), no edge (no crust), cream cheese, gold (stuffed with sweet potato), and hash brown. These sound decent, right? But wait, if you don't want a savory crust, you can always opt for dessert on the rim of your pizza. Mr. Pizza now also offers an egg tart crust AND a banana mousse crust. Talk about food experimenting! Dipping sauces for the crust are also offered on the side if you wish, such as blueberry, cream cheese, etc. Don't get me wrong, I admire Korean pizza chains for their creativity and food experimentations, but this pie was not my personal preference. The crust was rather soggy because there was just too much topping weighing it down, which explains why you eat it with a fork and knife. The original crust was too hard. The toppings themselves were good on its own, just on a pizza together was a strange combination. The onions were also too raw. 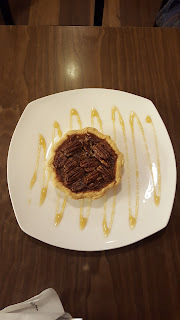 Moving on to Itaewon, we stopped by Tartine Pie, which made its cameo appearance on Running Man, when Yoo Jaesuk was doing a mission by the outside staggered blue benches right outside this place. The Itaewon branch actually has 2 stores directly across from each other, one with actual dining and meals too while the other is more of a cafe with the pies, and drinks. 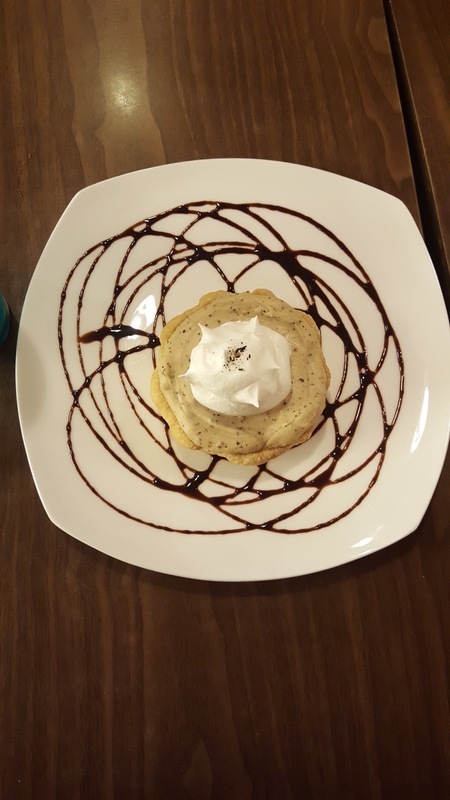 We opted to go for the cafe instead, since the Korean pizza had us pretty full from carbs. I ordered an early gray cream pie and a blue lemonade. My friend ordered the pecan pie and the iced tea of the day. The earl gray pie was light, the filling was the consistency of a cream puff filling. The crust was buttery and decadent. 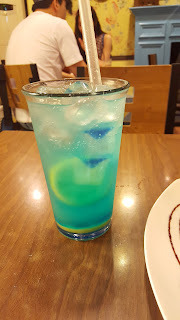 The blue lemonade was refreshing. It was also carbonated as most "-ades" are here in Korea.